With political parties beginning to name their candidates, media attention once again turns to the topic of criminals in parliament. Here we look at which parties are guiltiest of facilitating their entry into politics (data from National Election Watch). But that’s hardly surprising since these are the two largest parties in parliament. What you need is a measure of proportion, and things begin to look much better for the Congress. The BJP has nearly twice the percentage that Congress does of MPs in the Lok Sabha who face criminal charges. So far so good. However there is one flaw with this analysis: It is always possible that some parties gave a lot of criminals tickets of whom only a few were actually elected, while other parties gave a relatively small proportion of tickets to criminals of whom many made it into parliament. 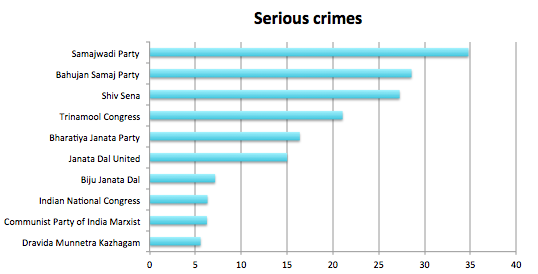 The picture changes when you look at the proportion of Lok Sabha candidates in 2009 who had criminal charges against them (ranked in the chart below by the percentage of serious charges). The BJP and Congress look much more comparable now, while the Communist Party of India (Marxist) makes a surprise entry at #3. 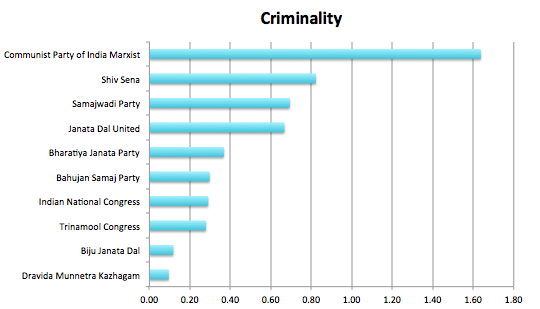 Overall the Janata Dal (United) and the Shiv Sena gave the highest proportion of tickets to candidates with criminal records. Finally not all criminally-charged candidates are equal. Of the total 1,114 candidates charged with a serious criminal offence, 355 (or the top 32nd percentile) had more than one charge. To test which parties gave election tickets to the most hardened (alleged) criminals, we count the number of candidates with more than one serious charge, add up the number of charges and calculate the total as a percentage of the total candidates per party. This allows us to calculate the intensity of the alleged criminality of each party’s candidates. Lo and behold the CPI(M) tops the list. This is only partly the consequence of chronic violence in areas of northern Kerala; the CPI(M) candidates with the most criminal charges stood from Palakkad in eastern Kerala and Bikaner in Rajasthan. The BJP’s alleged criminals are about 28 per cent more hardened than those of the Congress Party. The BSP, the only other party that had more than 400 candidates nationwide in the 2009 election, ranks about the same as the Congress. Should opinion polls be banned? Good start. It might help to break this down by nature of crime. It would help to clarify whether charges mean allegations or charges mean those that the police or other authority has framed through an investigative process and presented to a court as basis for trial. Also, there is a fundamental issue here. Either we agree that the judiciary works, in which case, charges are just that. Or we don’t in which case this becomes an unfair analysis. It does not help of course that conviction rates for serious crimes is minuscule in any case. Good suggestion. Election candidates are required to disclose only those criminal charges of which a judicial official has taken cognisance, equivalent to a US indictment. As far as the judiciary’s working is concerned, we can acknowledge what the biases are at the macro level and attempt to control for them or temper our conclusions. Milan Vaishnav has done much more detailed work on this question and dealt with some of these concerns in his methodology. Show AAP as a separate party. That will help people decide whether they are good candidates or not. The data here pertain to the 2009 elections when the Aam Aadmi Party did not exist. What are the names of 3 tainted MP of tmc? Trinamool elected four MPs to the 2009 Lok Sabha with criminal charges: Ambica Banerjee (Howrah), Adhikari Suvendu (Tamluk), Adhikari Sisir Kumar (Kanthi) and Tapas Paul (Krishnanagar). For the 2014 Lok Sabha elections you can get a preliminary, but somewhat inaccurate view here: http://adrindia.org/content/preliminary-candidate-report-lok-sabha-inc-bjp Keep in mind this is a partial list based on previous — not current — candidate affidavits. A true picture can emerge only after political parties announce all of their candidates which will not happen before Apr 25, the deadline for candidate nominations in the ninth round of the general election. M B Rajesh who leads CPM’s crime list is an MP from my locality and I can assure that most if not all of the cases are for protesting. This info becomes misleading in that context. He’s one of the more active parliamentarians with a high attendance percentage and a solid number of questions asked and debates attended.